Write for all things are now ready. The world is waiting for My Message of Love, and Hope, and Cheer. The very unrest of the spirit is a sign. The turning from the husk of religion is a sign. Man is no longer lulled by empty phrases and promises of a better life hereafter. He must know Me before he would wish to spend Eternity with Me. He must know Me here in the storm where he needs strength and rest. He has been sleeping; now he has been shocked awake. Now he must find Me or fling defiance at Me or school himself into denial, or indifference. Reason and argument avail nothing. Only by the lives of My followers can man be helped; only by seeing Mine unmoved, at peace, joyful, in a world of sorrow, disillusionment, and mistrust. Your denial today will not be “I know not the man.” The world is indifferent as to whether you know Me or not. No, it will be your failure to present Me in your life as I am — vital, sustaining, spirit-renewing, your All. Even among the distractions and manifold interests of the world — live in My Presence, yet daily withdraw yourself to be alone with Me. This year dwell much upon this stupendous truth. You need to abide in Me this year to share in the Spirit-life of the Universe, in its creative power and energy. Thus you are a part in God’s whole. But I must abide in you, for only so can I express My Love and Power and Truth through you interpreting them in deed, and look, and word. In these words of Mine you have My twofold nature. The Strong Protector! 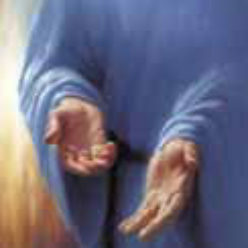 so Strong to shield; and offering you, My guest, all provision you need. And then you have Me in My Humility, one with you, your close Companion, dwelling in you, and dependent on you. Think on these things. Here in this evening hour I draw near to you — and listen. Tell Me of the Peace you know in Me; of the tender confidence in Me that has brought Peace and Safety into your life. Tomorrow you will go back into the world with My message of Eternal Life. Truths that you are only just beginning fully to grasp, that are bringing you Vision and Joy, you will pass to others, that they may be saved the wasted years that lie behind you. Turn to them as you would to one following you along a dangerous road and warn them against the pitfalls in their way. Point out to them the beauties of The Way, the sunlit hills ahead, the sunset glories, the streams and flowers of My peaceful glades. Direct their attention from earth’s allures or mirages to Me, your Companion of The Way. Tell them of your Joy in Me. That is your mandate from High Heaven. As yet you can only dimly see what this eveningtime will mean for you. For a while you shed earth’s cares and frets, and know the uplift of soul that comes through planned Communion with Me. You are renewed, and that renewing is your safeguard from mental and spiritual disintegration. In this brief time you taste, in contact with Me, something of My Resurrection Life. It is the glorified Christ you know, and to know Him is to partake too of His Risen Life. Thus health, physical, mental, and spiritual, comes to you and flows from you. Imagine the Hope of My Heart that day on the mountainside when I told My followers that to no throne on earth I led them; old forms and negations that had meant so much in the past were to be swept away; motives and impulses were to be all-important. By the thoughts of his heart was a man to be judged. Prayer was like a son appealing to a father. Love was to be the foundation, the Golden Rule. Tribal, even racial, distinctions were to be ignored and the claims of the whole great family of God were to be met. To such heights as they had never before scaled I led them, up to Peak-truths they had thought unscalable. What hopes I had of them as their wonder turned to Vision and they responded to My Message. What hopes I have today of each of you My Followers as you catch sight of your Land of Promise ahead. I am the True Light that cometh into the world, and men love darkness rather than Light, because their deeds are evil. Truly not all men desire My Light. Not all men would welcome its clear shining. Many shrink from its revelation, preferring the darkness that would hide their deeds, rather than the remorseless Light that would show the evil of which they are ashamed. Pray for Light, rejoice to have it, welcome its revelation, and so, when in your lives it has done its searching, cleansing work, then bear it yourselves gladly, triumphantly, out into a world that needs so sorely the Light of the World. By your unfailing trust in Me. By your joy, unrepressed by the difficulties of the way. By your tender concern for the weak and the wandering. By your acceptance of My Gift of Eternal Life. By your growth in Spiritual development, proof of that inner life, which alone can engender it. Make Me known, more and more, by your serenity, by unflinching adherence to Truth. Make Me known by My Spirit within and round you, your conduct and speech ever bearing witness to the Power and the Wonder of My Presence. So shall all men know that you are My disciple, and that your claim is never for the recognition of the self — but for Me, the Christ-in-you. Hush earth’s desires that you miss not My Footfall. It brings the strength of a warrior and the eagerness of a Lover. Let your heart thrill with the glad, “He comes.” Forsake all thought but the thought of Me as I enter. Soul-rest and heart-comfort I bring. Forget all else. Let Me lift the burden from your shoulders, My burden, borne for you. Here in quiet, we will rest, while you are reinvigorated. Poor dwelling, you feel, for the King of Kings. Yet I see your Home of Love as Love has made it. I come from locked doors, where youth is trying to live without Me; where old age, ever refusing to answer My pleading and knocking, now hears Me no more, and sits silent and alone. Comfort Me, My children. Make of your hearts a Love-Home for the Man of Sorrows, still so often despised and rejected of men. Yet I would turn their sorrow into joy. Hush your spirit still more in My Presence. Self dies, not by human combat, not necessarily by supplicatory prayer, but by the consciousness of My Presence, and of My Spirit-values. Thus self shrivels into lifelessness, into nothingness. It is so necessary to dwell with Me, to draw so close to Me in an understanding as complete as it is possible for man to realize. Do you not see now the need for the training and discipline I have enjoined on you? They are vital in that they attune your being to the consciousness of My Mind and Purpose. When this Mind is in you that is in Me you are able to penetrate the outer courts of the Temple, and in the very Holy of Holies to grasp the meaning that lay behind all I said and did and was. Sacrifice all for this. Your work has to be inspired. Where can you find inspiration but in My Presence? “How beautiful upon the mountains are the feet of those who bring glad tidings . . . that publish Peace.” When you are weary think that yours are the feet of those who bring glad tidings. This will rob your steps of weariness, will give a Joy and a spring to your walk. “Bringeth glad tidings. Publisheth Peace.” What a joyful mission. One of gladness and Peace. Never forget this, and the Joy of your message and mission will radiate from you gladdening and transforming. He descended into hell . . . He ascended into Heaven. It is good for man to know his Lord is ever with him through every danger, every change, every seeming chance. It is good to walk the dark waters with Me. I did not make the darkness. It was no artist-design to create a darkness which should make My Light seem the greater radiance. Willfulness and sin have caused earth’s shadows, but I am there to walk the dark places with you. So that even the darkest place may be illumined by the Light of the Sun of Righteousness. You are going to be a mighty force against evil because you will be ever-increasingly the agent of Divine Power. Think, when this is so, how could you for one moment imagine that evil could leave you alone? It is to the advantage of evil to thwart you. Think how those who care for you in the Unseen watch to see you conquer in My strength for My Glory. The great battles of your world are fought in the Unseen. Fight there your battles and win. More than conquerors through Him Who loves you. Fight with the whole armor of God, ready prepared for you. Victors through Me. Press on. Victory is in sight. The Joy that follows awareness of Guidance has ever been the upholding Joy of My followers. It is the result of desiring My Will only, in every detail, and then the realization of the wonderful way I can act for you when you leave the planning to Me. Truly all things, every detail in each day, do work together for good to those who love Me. My miracle-working power can become operative when there is no “kicking against the pricks,” no thwarting of My Will. Whether you walk here on earth, or are free from earth’s limitations in My Heaven, it is Heaven to walk with Me. Man has sought to describe Heaven in terms of music and song. That is but his endeavor to express the ecstasy he knows on earth in Communion with Me, and to anticipate its magnified intensity in Heaven. I am beside you — the eager Listener, so ready to hear your plea, so ready to say all that your heart needs. Live more with Me apart, and so there will come an ever-increasing helpfulness to others. Heart-poise, mental balance, spiritual strength, will be yours in ever more abundant measure. Never feel that you can help others unaided by Me, for therein lies danger. Your self-importance is destructive of helpfulness, devitalizing because your strength has such limitations. Mine is limitless. Grow more dependent upon Me, yet more assured that you can do all things through Me. Never lose heart. Kill the proud self as you go on, for on that dead self you rise. On ever with Me. Do not let earth’s frets disturb you. Since you cannot follow Me and indulge self, at all costs turn self out directly its claims disturb; so only can you keep spiritual calm. Not your circumstances but your self is the enemy. A man’s foes are those of his own household. Do others blame you falsely? I was reviled but I reviled not again. I am here. Realize My Presence. My love surrounds you; be filled with My Joy. You are being truly guided though not until you are content to be led as little children do you really live fully in the Kingdom of Heaven . Life with Me is of child-like simplicity. Simple souls are the great souls, for in simplicity there is majesty. But prayer is also a glad turning to meet Me for the joy of the meeting, for the rapture of My Presence. Prayer, too, is preparation for tomorrow’s return to those who need you, those to whom My love goes out from you. I am with you. I will help you. Through suffering to health, through sorrow to joy, through pain to ease, through night to day — you shall be led and comforted. Without previous experience of dawn and day none could dream that the glorious dawn and fullness of day could follow the blackest night. Regard this experience not as darkness but as dawn. 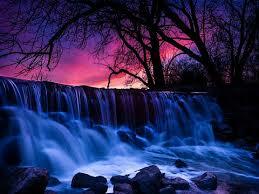 The first faint glimmers of light are following the black night through which you have passed. The full day is not yet. But hail the DAWN with Me. I am with you. I am delivering you. But look for deliverance not from circumstances alone, but deliverance from the self-ties that bind you to earth, and that hinder your entrance into the kingdom of the service in which there is perfect freedom. All is well. You shall rise to newness of Life. You cannot fail to rise as you free yourself from the toils and sins and failures that bind you to Earth. No past sin can enchain you. You look to Me and are saved. They are all forgiven. Conquer your faults with My Strength now, and nothing can prevent you from rising, nothing that is past. I am thy shield and thine exceeding great reward. Shield from the storm of life. Shield from even the consequences of your own faults and failings. Shield from your weakness. Shield from worry. Shield from fear and sorrow. Shield from the world with its allure and temptations. Not only your shield, but your exceeding great reward. Not the reward of perfection in your life, for that you could not win here. Not the reward of what you do, or of any merit in yourself. Only the result, or reward of your questing. The satisfaction of your hunger to find me. Exceeding great reward. Your reward is the same as that of the greatest saint who has ever lived. Given not as a trophy of victory, not as a recognition of virtue, but given because you are the seeker, and I, your Lord, am the Sought. I am the sharer of the secrets of your life. How rich in blessing each experience may be if shared with Me alone. How often, by much speaking and self-indulgent sharing with others, a jewel or rare beauty may be robbed of its priceless worth to your soul. A bud of Joy and sweet perfume too rashly forced to premature bloom will lose its purity and fragrance. Even the sharing of past sins and failures may mean self for the time in the foreground, or vitality, so needed for the present, lost. Dwell in the Secret Place of the Most High. I am the Lord of your life, Guardian of your inmost being, the Christ of God. Sheltered in My Hidden Place no harm can befall you. Pray to know this. Let this Truth become a part of your very consciousness, that where I am no evil can be, and that therefore when you abide in Me and I in you no evil can touch you. Spiritual Truths take sometimes many years to learn, sometimes they come in a flash of sudden revelation. January 24 – Have You? I am teaching you, but not always Spiritual Truths that gladden you. Often, too often, there has to be the word of reproof as I tell you of commands of Mine not obeyed, of resolutions made when in contact with Me that you have failed to keep, of work done for Me in no spirit of Love and Joy, of failure to obtain supply because your attitude (often not your heart) questioned My unlimited supply. I teach no easy lesson. I choose no flower-bordered path in which to walk with you, but take heart that I do walk with you as with Peter of old even when he denied Me. He had seen his sin. He went out and wept bitterly. I am listening. Picture Me, your Lord. Not as one deaf to your entreaties, but rather as One straining with an intensity of Love to catch the first faint cry from one of His children. Even in the case of those who love Me, how often do I listen in vain for the spontaneous words of Love? Do not cry to Me only when cares press and you are weary. Speak to Me often. Share with Me all the little happenings, all the frets, all the little glad things. These not only draw us more closely to each other, but they are to Me compensations for the neglect I suffer from My world. I am your Lord, trust Me in all. Never doubt My keeping Power. Behold Me, the Lord of your life. Gain strength from Me. Remember that Healing, Divine Healing, is not so much a question of praying on your part, and of granting on Mine, as of living with Me, thinking of Me, sharing My Life. That contact too makes you whole. Go forward gladly, go forward unafraid. I have not promised My Help to the virtuous only. To the sinner who turns to Me, to the saint who lives with Me, to both alike My miracle working Power is manifested. Help, temporal as well as spiritual, truly I bestow, not as a reward of goodness but as a fulfillment of My pledge made to all who believe in Me. But when one turns to Me I at once plan the rescue craved. If that one hearing My plan, learning of My Purpose, should fail to do his appointed task in that plan, how can My healing of physical, spiritual, or temporal disharmony be manifested? I am the Gift of God to man. Only so was it possible for man to know God the Father. Only so was it possible for man to know that he had ever an Advocate with God — the Sinless Christ. There is always One Who understands your case, Whose appeal cannot fail to be heard. He has the right of Sonship. He has a right to plead for you. If he can plead for offending man, undertaking full responsibility for him, what better Advocate could you have? He knows. He has seen the tears of sorrow, the heartache and temptation. He can plead as none other. His own temptation was so real that, conqueror as He was, He can yet feel the tenderest pity for the vanquished. He knows how seeming fair evil can appear, and He can estimate the added burden of tainted blood, inherited weakness and sin. He gave His only Begotten Son. This GREAT GIFT AM I, your Friend, your Companion. Leave all to Me, your Advocate, trained during My years on earth to plead, never for Myself, but for every one who rests his cause in My Hands. Study the “Overcomeths” in the Revelation to My servant John, and you will see the tender intimacy with Me promised as a result of overcoming. To believe is not enough. To believe in Me does truly involve the possession of Eternal Life, but that is a trust to use as truly as the talent of My story. It is not only a something to be enjoyed. Eternal life is a refreshing, reforming, enriching, uprooting, ennobling Power to be employed to the full by those to whom I entrust it. In this My servants so often fail, and so miss the wonder of Communion with Me. Guard this Truth. I come, a truly willing guest. Love always draws. Remember that. Love is the magnetic Power of the Universe. God is LOVE, the Power that draws all men by various ways unto Himself. Remember that your Love too, being of God, has the same magnetic Power. Love, and you will draw to you those whom you desire to help. When you fail to do so, search your life. Love is deficient. More love is necessary. Softly at even, comes the footfall of your Master. My day has been long and weary. Hearts that I have yearned over and longed for still withstand Me. I see the aged, desolate without Me. I see the disappointment of men and women, who in Me would find heart-satisfaction which others cannot give them. I see youth crowding Me out of its work-filled, pleasure-filled days. And yet I wait. I knock, I plead, I call, unheard, unheeded, unwanted. As I was the link between the Father and men, so now must My followers be the links between man and Me. Human Love, material aid, human understanding, and friendship must bind those for whom I yearn. Channels through which My help can flow to man truly you must be, but also the means through which man finds his groping way to Me.